Interested in Mountain Biking in Thredbo in Summer? Home / Blog / Ready for Biking at Thredbo in Summer? Ready for Biking at Thredbo in Summer? The Snowy River Shire Council has added another 5k biking trail to the mountain! The development of mountain bike tracks and shared paths has taken another leap forward this summer with the completion of about 5km of track from the Jindabyne Dam wall to Tyrolean village on the shores of the lake. This project was co-orindated by the Snowy River Shire council in response to the community planning discussions that have taken place over the past 2 years. An idea was put forward from these meetings to explore the possibility of building a shared pathway around the whole foreshore of Lake Jindabyne and the “Tyrolean Track” is the next step towards making this happen. While there is a long way to go to encircle the lake, this section of track is one of the more challenging so it has taken a big chunk out of the project. 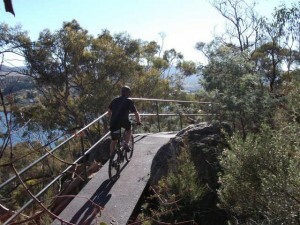 The track is designed to be an easy mountain bike track and shared walking track with no excessively steep sections and plenty of fantastic look outs offering spectacular views including the dam wall, the town of Jindabyne and the mountains behind. The next stages of the track to be tackled are the section between the dam wall and town and then the connection to East Jindabyne. The new Lakeside trails have been spurred on by the ambitious development of the shared track from Thredbo to Bullocks Flat at the Ski Tube. This track has been under development for 3 years but being in the national park, there are some major challenges to ensure that the construction has no serious impact on the pristine Thredbo River valley. The goals for the Thredbo Valley track this summer have included the construction of 3 major bridges which will be 30 metres in length each and span the river at a height of 4 metres. These bridges will offer scenic highlights along the track with elevated views both up and downstream. The bottom section of the Thredbo Valley track has been completed offering great riding and walking between the Thredbo Diggings and Bullock’s Hut where this track joins a riverside trail built on a crown reserve boasting some excellent mountain biking down stream with an inland loop coming back. While there is still some work to do there is no question that the Snowy Mountains are on track to becoming a serious bike riding destination. The Thredbo Jazz, Funk, and Groove Festival Will Play Some New Music This Year! We Have New Thredbo Accommodation Deals for Season Opening! Had a great stay, perfect! I was blown away with how much was already available in the apartment We had a wonderful time due to the extremely well appointed apartment, beautiful view and location as well as professional, friendly staff! good layout and the location suited us well. We (2 adults and 3 kids) really enjoyed our stay at Banjo 2 for the 6 nights. It was a good layout and the location suited us well. Thanks a lot. Can recommend both apartments for a winter or summer holiday to anyone. We have stayed at Lantern Apartments for many years, Ian, Jill and staff have always made us very welcome, this year we stayed at Banjo three, in August, very comfortable and cosy also stayed at Lantern 34, for the October long weekend, 34 very spacious and comfortable. the flare run was wonderful, plus the fireworks. Can recommend both apartments for a winter or summer holiday to anyone.also with wonderful views of the mountains. Will definitely be back soon! The space was amazing, the view was amazing - the staff at reception were so lovely and so informative. My guests and I had an amazing time and will definitely be back soon!